Android Nougat has just lasted a year and a half, but has finally became the biggest and most popular Android version of them all. According to the latest poll, we find Android Oreo, the latest version of Google's operating system, at 1.1 percent of all Android devices. This is evident from the latest calculations of the Android Developer Dashboard. 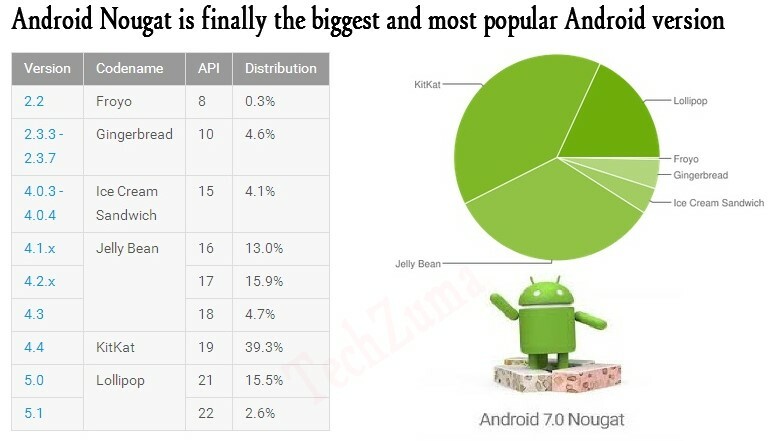 The distribution of Android, also called the distribution figures, remains a problem for Google. The search engine giant is not able to roll out the latest version to Android phones and tablets. Now we understand that Google is dependent on the arbitrariness and cooperation of more than 400 producers worldwide that make Android products. However, almost six months after launch, Android Oreo - existing in versions 8.0 and 8.1 - can still only be found on one in a hundred devices (1.1 percent). By comparison, this share was 0.7 percent at the beginning of January. The reason why Android Oreo's market share is still so small is that many manufacturers are still busy testing the new operating system. Then we are talking about parties like Samsung, Nokia and Huawei. Only when everything is 100% approved will they start rolling out the operating system. In addition, only a handful of telephones are supplied with Android Oreo as standard. Then you can think of devices such as the Huawei Mate 10 Pro, Honor View 10, Sony Xperia XZ1 and Sony Xperia XZ1 Compact . But brand new phones like the LG V30 and Honor 7X, two fairly new devices, however, running on Android 7.1 Nougat. We expect that in the near future Android Oreo will find more and more phones and that the share will increase automatically. Android Oreo does not have the smallest market share according to the measurement of the Android Developer Dashboard. Ice Cream Sandwich and Gingerbread form the flakers with a share of 0.4 percent and 0.3 percent, respectively. The latest poll shows that Android Nougat - existing from version 7.0 and 7.1 - is now the largest. This title was reserved for Android Marshmallow for a long time. The share of Android Nougat last month rose from 26.3 percent to 28.5 percent of all Android phones and tablets. Android Marshmallow fell from 28.6 percent to 28.1 percent. Finally, we find three other Android versions in the statistics of the Android Developer Dashboard. These are Android Lollipop (5.0 and 5.1), Android KitKat (4.4) and Android Jelly Bean (4.1, 4.2 and 4.3). Their market share in the last count is 24.6 percent, 12 percent and 5 percent respectively. Apple's operating system, the biggest competitor of Android, according to the latest figures on two thirds of all iPhones and iPads (65 percent), runs iOS 11, the latest version.